According to standard narratives of English legal and political history, the right of sanctuary - which enabled malefactors to take refuge in a church or ecclesiastical precinct - had had its day by the early sixteenth century. Sanctuary had fulfilled a useful purpose in earlier eras characterised by more informal modes of conflict resolution. However, by the later Middle Ages it served only to frustrate royal justice, enabling hardened felons to break the law with impunity. This was a system that suited only criminals and the religious houses who jealously maintained their sanctuary rights for institutional advantage and profit. It was inevitable and salutary, therefore, that the Tudor regime should overhaul this outdated practice as part of their vigorous programme of secularisation and state formation. The achievement of Shannon McSheffrey's masterful new book is to demonstrate that almost none of this traditional interpretation passes muster. Her diligent researches into the legal records of fifteenth- and early sixteenth-century England reveal a surprising and hitherto unappreciated pattern. Rather than fading into obsolescence, sanctuary-seeking was in fact steadily growing in popularity. This upturn seems to have originated in the mid-1400s, and reached its peak in the years 1525-35, before a sudden and precipitous drop occurred in the late 1530s. 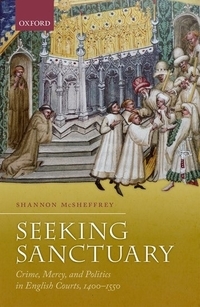 In seeking to explain this trend, McSheffrey presents a perceptive and persuasive analysis of the place of sanctuary-seeking in England, 1400-1550, which focuses on 'the intersections of culture, law, politics, and religion'. Two different versions of sanctuary operated in later medieval England. The first was the time-honoured practice whereby offenders could take refuge in any parish church or cemetery for a period of forty days, after which they were either to surrender to the authorities or permanently abjure the realm. The second version, which McSheffrey labels 'chartered sanctuary', was a more recent development. An exclusive and varied group of ecclesiastical institutions - including the Benedictine monasteries of Westminster and Durham Cathedral, the Cistercian abbey of Beaulieu, the Hospitaller Order in England, and the collegiate churches of St Martin le Grand (London) and Beverley - successfully asserted their right to shelter sanctuary-seekers in perpetuity. 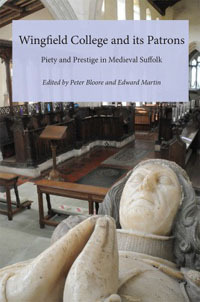 Much remains unclear about how and why this privilege originated (apparently in the late fourteenth century), but the key point - as McSheffrey emphasises and other scholars have previously noted - is that late medieval sanctuary operated in England wholly within the common law, with ecclesiastical institutions largely basing their claims to offer permanent asylum on royal charters. If sanctuary was flourishing in pre-Reformation England, therefore, it was with the blessing of the regime and the political elites. McSheffrey offers a number of convincing explanations as to why this was so. She argues that the turmoil of the Wars of the Roses significantly boosted the appeal and respectability of sanctuary-seeking. Several of the main actors in that political drama (including, on two occasions, Queen Elizabeth Woodville) themselves sought asylum in sanctuaries, which came to be seen as valuable refuges from tyranny. The association of 'chartered' sanctuary with royal mercy brought further positive valence to the practice. The availability of unlimited sanctuary, moreover, was of particular practical benefit to the aristocracy. With few opportunities to make a living while taking refuge, only those with private means or external sources of aid would be able to remain in situ for any extended period. McSheffrey also convincingly links the growth of sanctuary-seeking in early Tudor England with changing approaches to the prosecution of felonies. For much of the fifteenth century, aristocratic feuding was handled informally through arbitration and litigation. However, the Tudor regime took a firmer line towards felonies, insisting that they should be tried in the royal courts. Since it was not in the Crown's interest to execute aristocrats and royal officials who killed (or arranged the killing of) a rival in the course of a family feud, sanctuary therefore provided a useful instrument for mitigation. Elite miscreants could take refuge for as long as necessary - thereby evading the dangers of a quick trial or act of vengeance - while their families or patrons sought to arrange a royal pardon or an out-of-court settlement with aggrieved parties. McSheffrey discusses a number of examples of such aristocratic manoeuvring in Henry VIII's England, and it appears that the practice was thriving in the 1530s. In the majority of cases, the pardoned sanctuary-seeker was able to resume their career without impediment, with several such men (including Richard and Robert Southwell) going on to play prominent roles in local justice as JPs or sheriffs. It is clear, therefore, that the system of sanctuary as operating in early Tudor England was neither an outdated survival from bygone times, nor the stultifying product of ecclesiastical privilege. That is not to say that religious houses did not seek to protect and augment their rights of sanctuary, and maximise institutional benefits, wherever possible. Their heads routinely claimed that their (recently-minted) privileges to offer unlimited sanctuary dated back centuries. Prelates like Dean John Caudray of St Martin le Grand (1435-58) fiercely defended their house's sanctuary rights whenever challenged (generally by civic authorities, who disliked the presence of ecclesiastical liberties in their midst). In practice, however, as McSheffrey expertly demonstrates, the scope and nature of these rights were far from stable or clear cut. In a fascinating chapter on the Knights Hospitaller, she discusses how by the 1480s sanctuary rights were increasingly claimed at outlying properties of the Order, including residential houses in its possession. There was much scope for confusion, creativity and opportunism among late medieval sanctuary-seekers. Two men (unsuccessfully) claimed that grabbing the cloak of a passing Hospitaller was sufficient to avail themselves of the Order's privileges. Meanwhile, the sanctuary men of St Martin le Grand frequented the back room of a tavern just outside the bounds of the church's liberty, asserting that they were immune from arrest while touching the back wall of the establishment. Debates over the precise extent of the Hospitallers' privileges also reflect a kind of secularisation of late medieval sanctuary, as sites of potential refuge were no longer confined to churches and religious houses. By the early 1500s, the town of Knowle in Warwickshire was recognised as a sanctuary town, solely on the basis of its connections with Westminster Abbey (the lord of the manor). The everyday administration of Knowle's sanctuary was carried out entirely by lay officials, as indeed was the case in the liberty of St Martin le Grand by the early sixteenth century: by this point in time, McSheffrey argues, 'the laymen had to a great extent taken over sanctuary' (141-2). In the light of the evolution, diversification and popularity of sanctuary in the years up to the mid-1530s, its sudden collapse at the end of that decade was far from inevitable. McSheffrey attributes this development to the Dissolution of the Monasteries, which deprived sanctuary of its institutional framework. Parliamentary attempts in 1540 to transfer sanctuary privileges to eight nominated towns ultimately failed, apparently because of the civic authorities' lack of enthusiasm for a practice which seemed to undermine their own jurisdictional powers. Other mechanisms would be found to ensure leniency for members of the elites who committed felonies. Seeking Sanctuary is a marvellous piece of historical research and writing, which greatly advances our understanding of the role and place of sanctuary in early Tudor England. McSheffrey explores her subject through a series of beautifully-crafted case studies and engaging vignettes. This is not intended to be an exhaustive treatment of the subject, and certain facets are more fully explored than others. The use of sanctuary by debtors is a topic that would merit further investigation, while McSheffrey devotes significantly more attention to London than to the relatively well-recorded northern sanctuaries of Durham and Beverley (which seem to have served rather different clienteles). Some discussion of the wider British and European context would also have been of interest. These are themes which will hopefully be taken up by other researchers; and any subsequent studies of late medieval sanctuary will be greatly in Shannon McSheffrey's debt.